Having fun, being playful and connecting with other creative people and laughing are all things that improve our own creative abilities. We know this but why then isn’t it higher up our list of priorities more of the time? Mmm I suppose the serious sensible things in life do have to take priority every now and then! 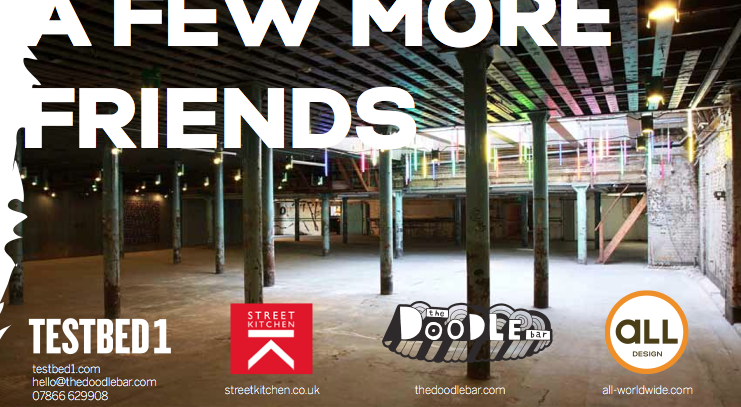 I was delighted to be invited to take part in Will Alsop’s latest show at Testbed1 last week; the title was A Few More Friends and the theme was Something Stolen. Everyone who was there had worked with or was good friends with Will while others, like myself, have brushed shoulders with him much more recently. (Back in January of this year I helped to create one of his 3D paintings at The Public in West Bromwich). A Few More Friends: Something Stolen was a one night only show and was the perfect combination of organisation and laid-backness. George Wade had sent out various exhibition plans in the run up to the show and I set up Hyacinth working to one of those plans but it was quite late into the evening before I realised that there was an even more recent plan; one that had only been finalised that day! So I may have inadvertently pinched someone else's spot on the plan but luckily everyone was very good spirited. There was a mix of architects, designers, creative agencies and artists taking part. Suffice to say that everyone was creative and we were all there to have fun, connect with others and show off a little of our own creativity. The more people that I chatted during the evening the more that I realised that Will Alsop is a magnet for mavericks and free thinkers: we had even more in common with each other than at usual art events or private views. At first I was a little worried that Hyacinth might be interpreted as being straight, just pretty and traditional. Her body is a biscuit tin (a 1952 Carrs biscuit tin) and her legs are classic cabriole furniture legs, the kind usually associated with hand embroidered tapestry footstools. But her engaging personality shone through and she got a lot of positive interest over the evening. My friend Sydney Levinson was all too pleased to get up close and personal with Hyacinth's underbelly of scratchy synthetic grass. There are often intimate details in my Frillip Moolog beings; things that people only notice after spending a bit of time with them. It is impossible to speak about all of the work on show and I don’t have photos of some of my favourite pieces either. Feix and Merlin’s installation of lit candles was pure genius. The candles spelled out Steal Me however each candle had Buy Be printed onto its surface. Their installation, Steal Me Buy Me Blow, was perfect and of course at the end of the night most of the candles had been stolen! Earlier in the day we visited Designersblock’s London Design week show at The Southbank Centre. There we met and chatted to Flora McLean of House of Flora -who was also part of Something Stolen that evening. 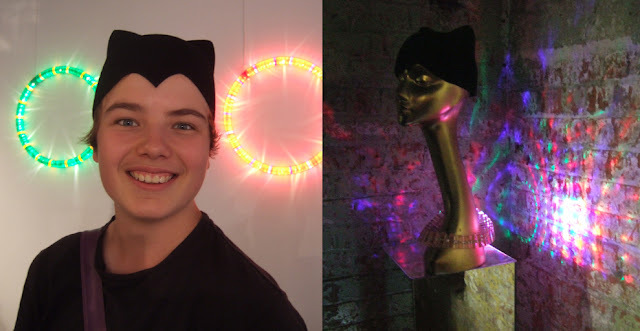 Here my son Dom models a House of Flora black felt cat hat at Designersblock and the neighbouring image shows part of Flora's cat burglar crime scene installation back at Testbed1 for Something Stolen. Flora also teaches at the Architectural Association at RCA so it is fitting that she should design and wear a Tatlin’s Tower inspired headpiece. But of course no excuse required to wear an iconic peace of wearable art? Meeting and chatting to Iain Carson and Paul Stallan at the end of the evening was brilliant. They were both overflowing with energy and enthusiasm, and they were very funny too! Their cheeky take on the Stolen theme was to gain access to a skip full of a day’s model-making waste from a very well known architects practice whose offices are very very close to Testbed1. With that exciting load of ‘scrap’ they played and had a huge amount of fun. Their construction/concoction called Tunnel Vision was delightful, exciting, fun, cheeky and jam packed with beautiful little moments that were worth photographing. I could go on... but I won’t! Even an old broom was included! And as I love stories and stories do have beginnings it was great to see Graham Peet and his team of animation and games design apprentices at Testbed1. Graham is the Exhibitions Manager at The Public in West Bromwich. The Public is one of Will Alsop’s designs and it was Graham who first invited me to exhibit some of my Frillip Moolog beings at The Public back in summer 2011. Stories have beginnings but no ends they just go on and on and hopefully they never become predictable; surprises and enjoyable twists in a tale are good. Roll on my next exciting adventure!